By day, six-year old's Connor, Amaya and Greg go to school like everyone else. As night falls, they put on their pyjamas, activate their animal amulets and magically transform into superheroes - Catboy, Owlette and Gekko -- and become the PJ Masks! Just in time for the Easter school holidays, we have some cool new treats for little PJ Masks fans. The PJ Masks are on their way, into the night to save the holi-days! The Easter Bunny can deliver the perfect egg for PJ Masks fans. Milk chocolate egg 40g and Melamine breakfast set, including bowl, spoon and cup. Everything you need for a great start to the day. Available from Aldi, Woolworths and Target. Milk chocolate egg 60g and Ceramic Mug to kickstart your morning. Available from Target and Woolworths. Crack open that egg to reveal some PJ Masks surprises. Available from Big W and Target. Hollow Milk Chocolate Easter Egg 100g. Available from Kmart. Look inside the tube to find six brightly coloured Easter Eggs and a cool Poster. Available from Target. Easter and school holidays are the perfect time for lazy mornings and pancakes for breakfast. With Green's PJ Mask Blueberry Pancake Shake, simply add water to the pancake shaker and watch the mix turn Catboy blue! You can whip up fluffy pancakes with blueberry pieces, no artificial colours and flavours, and with 25% reduced sugar. Available from Woolworths. PJ Masks games for the whole family plus activities to keep your little superhero busy. These cool 36 Snap Cards feature all your favourite PJ Masks characters! It's the fun, easy matching game for all the family. Suitable for 2-4 players aged 3 and up. Available from Big W.
Family fun for everyone with 36 Fish Cards featuring all your favourite PJ Masks characters. Suitable for 2-4 players aged 3 and up. Available from Big W.
A PJ clad superhero version of the traditional memory card game! Children will have fun finding matching PJ Masks pictures while testing their memory as they play. Suitable for 2-4 players aged 3 and up. Available from Big W.
The PJ Masks Press-O-Matic Game is a great family game where players try to reach the finish line before their opponents. Land on an opponent's piece to send them back to the starting line. Featuring your favourite PJ clad superheroes, this game is sure to provide hours of family fun. Suitable for 2-4 players aged 3 and up. 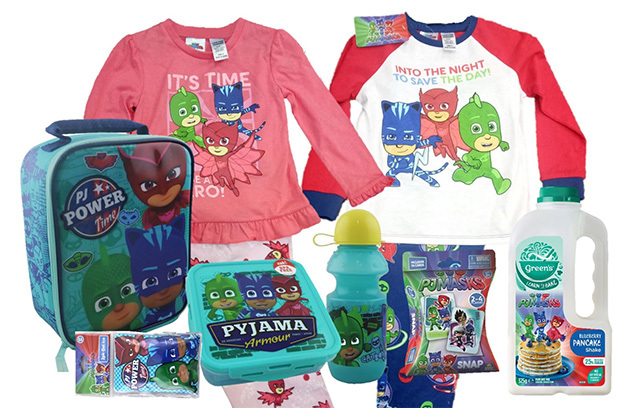 Available from Big W.
As the cooler weather approaches, young fans can keep warm with the new PJ Masks PJs and long-sleeve tee. Show your PJ Team Power with these new threads!